Update (10:15am): They've sold through 5 cases of this wine and it is now sold out. Hop on their email list to catch the next deal. Bin Ends Wine (with locations in Braintree and more recently Needham, MA) is offering up a strong deal this morning. 2 bottles of 2008 Robert Foley Petite Sirah for $64 ($32/bottle). Compared to a $60 release price that retailers don't often deeply discount this is a very good price. Bin Ends has 60 bottles of this wine to offer. As of this writing they're down to 54. Better get on it! 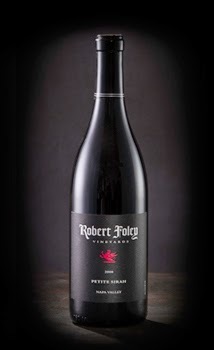 I tasted through Robert Foley portfolio at a wine dinner at BOKX109 a few years ago and the Petite Sirah was a standout for me, drinking better than the much more expensive Claret and Cabernet Sauvignon. And his Merlot is amazing too. I think both the Petite Sirah and the Merlot are the value plays at around $50. So to be able to find them for $32 fully loaded (no additional sales tax on wine in MA!) is a terrific deal. 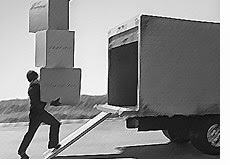 Bin Ends offers delivery to MA addresses and will hold your wine for in-store pick-up at either of their locations. Question of the Day: Have you had Robert Foley's Petite Sirah lately? If so what did you think? So I was poking around the Wine Spectator ratings database to see how early reviews for 2012 California Pinot Noirs were trending. For me it's been an inconsistent vintage and a bit disappointing compared to high expectations. But I spotted a web-only review for a wine I hadn't noticed before. The 2012 Castle Rock Russian River Valley Reserve Pinot Noir was rated 90 points by Wine Spectator. With an $18 release price it's the only sub-$20 California Pinot Noir Wine Spectator has rated 90+ points going all the back to the 2007 vintage. The next closest thing I could find was the 2007 Siduri Sonoma County Pinot Noir at $20/90 points. So going by the numbers this may very well be the best affordable QPR play for California Pinot Noir Wine Spectator has ever offered up. Although I've had my share of Castle Rock wines in the past (you see it all over the place including Trader Joe's from time to time) I don't think I've ever had one of their "Reserve" wines. Whatever that means. Nonetheless their wines are generally "good" and sometimes "very good" and they're almost always a respectable value. But this one really has me curious. 90 points for less than $20 in a category I really enjoy drinking? Sold. Question of the Day: Have you had this or other Castle Rock Pinot Noir recently? If so what did you think? Artisinal French wine purveyor and WWP sponsor Ansonia Wines is making it easier for Boston-area enthusiasts to taste their wines and pick up their orders. 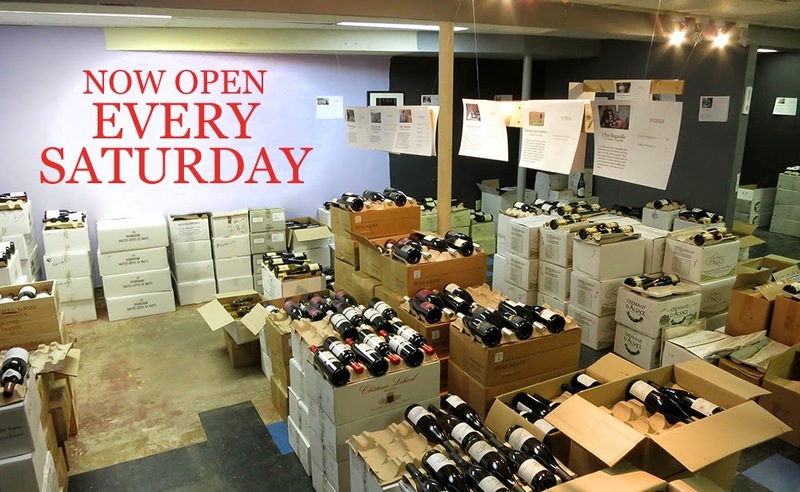 Each Saturday their Newton Depot is open for pick-ups and once a month they're holding Owner's Hours which means they'll have 4-6 wines open and owner Tom Wilcox will be on hand to describe the wines and help visitors make selections. See also: Ansonia Wines, The Garagiste of the East? This Saturday they're open from 10am-4pm. Tastings are free and there's a 10% discount on case purchases. If you're not in the area, delivery is available. Subscribe to their email list for notification of new offers. Follow @AnsoniaWines and ping them on Twitter if you're interested in learning more about their wines. I'm pleased to hear friends of the WWP are among their better customers. Definitely check them out. The past decade has been a wild ride for wine critic Antonio Galloni. He founded the narrowly focused Piedmont Report while working separately in business in Italy. 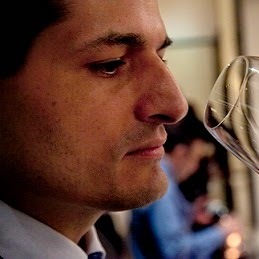 His coverage propelled him to being picked up by The Wine Advocate to cover the wines of Italy. Then just as it seemed he was the heir apparent to Robert Parker after being assigned not only Burgundy and Champagne but California in 2010, he left The Advocate in 2013 after the publication was acquired by foreign investors. He then founded the independent online property Vinous Media where he's been focusing his efforts since. When Galloni was assigned the California beat by The Wine Advocate it created a stir in the wine community. Terroir-driven producers quietly rejoiced as they anticipated more favorable coverage for their wines after decades of accolades for "bombastic over-the-top fruit bombs" from Parker. But Galloni's reign as California critic for The Advocate was short lived. Yet his coverage was well regarded and fans have followed him to Vinous Media. What kind of wine enthusiast does Vinous appeal to? And how does it differentiate itself in an crowded market? Vinous is our vision of a modern-day wine media platform that places consumers inside the conversation and encourages them to form their own opinions. Vinous brings together professional reviews, the stories behind the wines and the perspectives of our readers in nearly 50 countries using multimedia and leading edge technology. We visit hundreds of wineries each year, allowing us to offer unparalleled, first-hand insight into the world of wine. Since going live in May 2013 Vinous has become one the fastest growing wine content websites in the world. Regular features include comprehensive reviews of new releases from Italy, California, Champagne and Burgundy, vertical tastings and retrospectives, in-depth videos shot on location, Vinous Favorites - our top picks under $25 - and Vinous Table, where we profile our top eating and drinking destinations. I'd seen retailers and wineries touting Galloni's scores (for the 2011 Flowers Pinot Noir and the 2012/2013 Arnot-Roberts wines specifically) so I was curious to validate the ratings and get a feel for the Vinous site. I reached out to Vinous and asked for a trial subscription for review. They obliged and I got a chance to poke around and speak with Vinous Co-Founder James Forsyth about the site. Vinous doesn't have the breadth of coverage you'll find on Wine Spectator and Wine Advocate. But it does provide deep, high-quality coverage on the areas it chooses to focus on. There are 35,000 wines in their database. Regional coverage currently includes Italy, Burgundy, California, Champagne, and Bordeaux. Expect that to increase when a new critic is added to cover additional regions later this year. The vision of Vinous is for it to be a multi-contributor site. Within each region, coverage focuses on wines people are talking about. 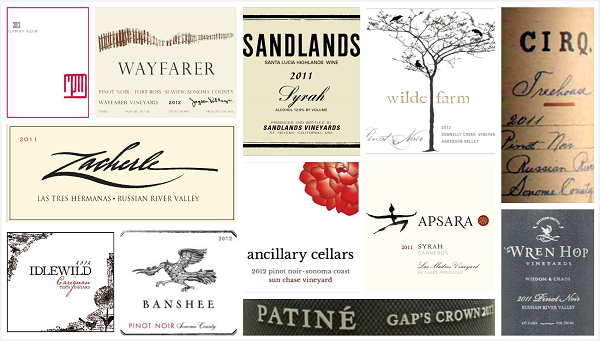 Wineries reviewed Sonoma and Beyond include Anthill, Arnot-Roberts, Bedrock, Carlisle, Ceritas, Dehlinger, Donkey & Goat, Kosta Browne, Kutch, Littorai, Peter Michael, Radio-Coteau, Rivers-Marie, Rochioli, and Zepaltas. In The Undiscovered California newer producers like Ancillary, Banshee, Cirq and others are identified and reviewed. Although Galloni is on the road tasting 6+ a year, he doesn't have time to visit every wine region in the world. He's clearly focused on tasting the wines people are talking about as well as introducing consumers to new wines they may not have heard of. Like the 2010 Macdonald Cabernet Sauvignon. 95 points Vinous Media. $150. Pricey for sure but I've never heard of it. Vinous is sleuthing out producers like these we may not hear about from other publications for a few years. The overall structure of coverage is more aligned with The Wine Advocate than Wine Spectator. Several paragraphs describe current trends and vintages in each region. Then reviews are primarily sorted alphabetically for each winery whose wines are included in the article. 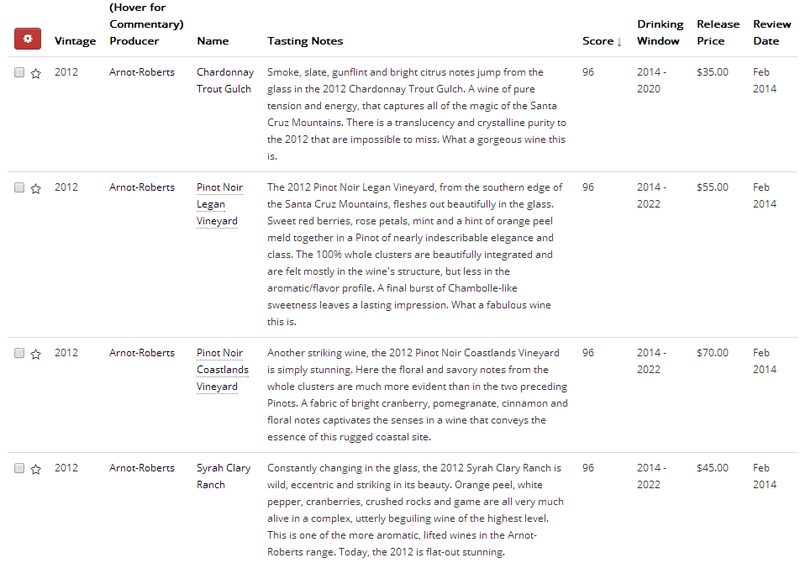 It's easy to get a listing of all the wines reviewed in the piece to sort by price and score. Additional advanced search functionality makes it easy to find wines by region/variety/score/cost etc. I found the site well organized and easy to navigate, which I attribute to their being an online-only publication and their fine work designing the site. Galloni prefers to taste on-site at the wineries with the winemakers when possible. In doing so tastings are almost always non-blind but enable reviews to contain more context than they otherwise would. They don't take advertisements from wineries. Galloni aims to be style-agnostic in his reviews and along with his team of 3 or 4 others currently they're fairly data-driven in their approach. For example, they'll go back and monitor scores for wines over the last 7 years to see whether score inflation is occurring in Galloni's ratings (they say they're not). And whether the ratings given to wines from more highly rated vintages are actually higher. Sounds smart to me. I like it. The site also includes videos and interactive maps of vineyards. The videos range from Galloni chatting with sommeliers and winemakers to him sitting at his kitchen table discussing newly released reviews. The simple kitchen table review format helps you get a feel for kind of person Galloni is and a feel for his depth of useful knowledge. For example, I was particularly impressed with Galloni's thoughts on 2012 Sonoma Pinot Noir. He went into great detail about how 2012 was an abundant vintage which sounds like it would be a good thing but can create dilluted wines if crops weren't appropriately thinned. 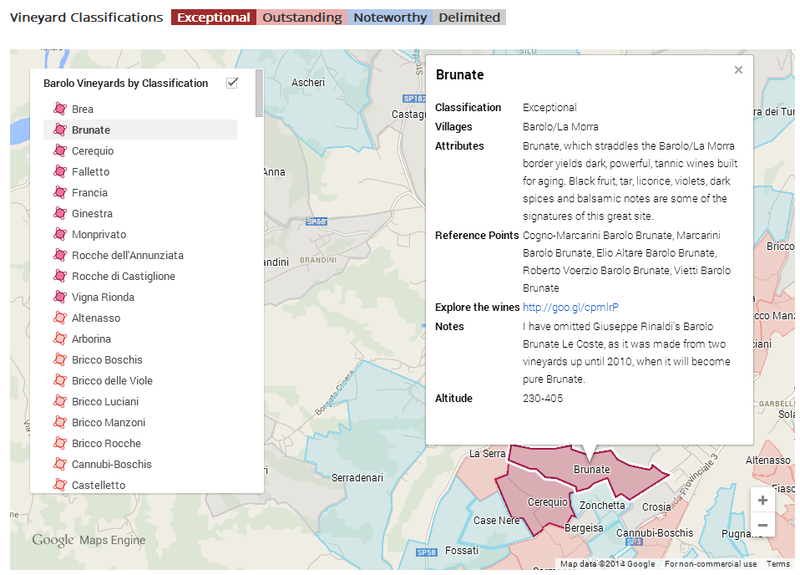 Vineyard map coverage includes Barolo as of now but look for that to expand. "A model of total elegance and class, the 2011 Pinot Noir from Flowers is absolutely gorgeous. Savory herbs, crushed flowers, licorice, salt, orange peel, mint and plums are all woven together in the glass. Today, the 2011 is impeccably crafted and flat-out gorgeous. Although very much a medium-bodied wine, I would not at all be surprised to see the 2011 blossom with more time in bottle. This is an impressive effort. Unfortunately, the Sonoma Coast was the only 2011 Flowers Pinot I was able to taste, but based on this effort, 2011 is certainly shaping up well here. I thought the wine was terrific as well. He went nuts for recent releases from Arnot-Roberts, scoring them in the 94-96 point range. I've tried a couple of them and thought they were phenomenal. Another match. Then I checked his review of the 2011 Radio-Coteau Robert's Block Zinfandel. I absolutely adore Radio-Coteau's Pinot Noirs. They're one of my favorite producers. But I had a really rough time with the 2011 Robert's Block Zin. "Bitter with dusty drying tannins and quirky vegetable notes. A massive disappointment given how reliable RC Pinots have been for me. "The 2011 Zinfandel Robert's Block boasts tons of depth and intensity but also imposing tannins and high acidity. Today, the elements aren't fully put together and the wine appears to be disjointed, with angular contours and less of the fruit I saw last year. This is an awkward showing from the 2011 Robert's Block. The 88 point rating seems generous given the words behind the review (disjointed/angular/less fruit/awkward). I do get a sense that when Galloni likes something he's not afraid to give it a big score even if the wine doesn't come from the absolute most prestigious category. But what's important is the rank order of this wine vs others it is compared to. What we both agreed on is that this was the worst Radio-Coteau we ever tasted. So I'll take that as another match. See also: Who tosses around the 90+ point ratings more casually, Wine Spectator or Wine Advocate? Note: I still love Radio-Coteau and I will continue buying other wines from them especially their Pinot Noirs. I consider them one of my Top 3 California Pinot Noir producers. I just wanted to provide a sense of what a negative review looks like on Vinous. The site also includes user forums and premium subscribers get early/preferred access to Vinous events. Like the upcoming Tuscany in the City at Del Posto April 26th. The market for professional wine criticism is increasingly crowded. Beyond Wine Spectator and The Advocate you've got Tanzer, Suckling and Galloni. Beyond that you've got varietal/regionally focused critics as well. Getting a chance to speak with James from Vinous Media and checking out the site gave me a much better feel for where Vinous Media fits into the mix. I hope this post gives you a better feel for them as well. Subscriptions range from $120/year to $210/year for a premium subscription which includes priority access to events and other special offers. They also offer Group subscriptions aimed at folks in tasting groups or friends who want to get together and save money on a subscription. Question of the Day: If you're a Vinous Media subscriber what do you think of it so far? If not, what wine publications do you currently subscribe to and why?